Ask A Vet: Feed is Expensive! How much should I really be feeding my horse? Recently with hay and feed prices at an all time high, and Colorado mired in drought, we have been fielding many questions about nutrition, and how much to feed for optimal results. There are many answers and many opinions on the topic, and we thought we would take some time to get quality, factual information out to all of you. 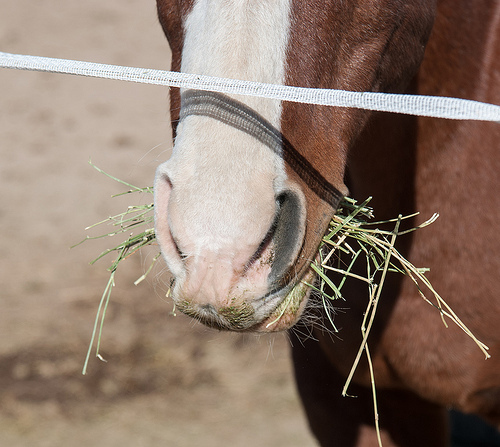 There are some basics to always keep in mind when feeding your horse. Firstly, horses have a relatively small stomach size in relation to their overall size, so a large amount of digestion occurs in their “hindgut” – the large colon and cecum. What this means to you is that you are feeding an animal that has evolved to graze and consume small amounts of feed all day long. When left to their own devices out on pasture, most horses would graze for 18-20 hours a day. That’s a LOT of nibbling! So always try and spread out feedings as much as you can to better resemble the feeding schedule horses have evolved to accommodate. Secondly, all horses have the same basic requirements for good nutrition. The single most important requirement is access to free choice, clean water. No amount of nutrition can be utilized without it, so don’t forget to make sure that your horses are drinking enough. “Enough” means 5-15 gallons per day – depending on weather, work load, and the horse. Quality forage is the next most important thing for a horses’ diet. Forages like grass hay, alfalfa and/or pasture grasses should account for AT LEAST 50% of your horses’ total diet on a dry matter weight basis, and can account for almost ALL of their diet. Making sure that you have good quality hay can be a challenge, but the county extension office can often answer questions about nutritional content of specific hay. For some horses, activity level or age can prevent them from getting all they need from just quality forage. These horses may need supplementation from concentrated feeds like grains and pelleted feeds. There are as many different feeds are there are horses, so make sure to look for something that is designed for your horses’ job and/or stage of life (do you have a lactating mare? Do you have a senior citizen?). This can also be a way to make sure that your horse is getting all of the vitamins and minerals that they need for a complete diet. So, with those basic requirements in mind, let’s answer the question “how much do I feed my horse?” As mentioned above, the age of your horse and their level of activity will affect the answer to this question, so always keep them in mind. 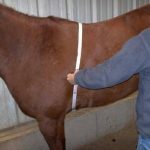 Next, you need to figure out your horses’ weight (EVERYONE SHOULD OWN A WEIGHT TAPE), and assess their Body Condition Score (a chart can be found here: http://umaine.edu/publications/1010e/). 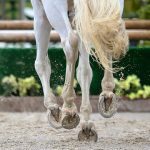 You should aim to have your horse be a 5 or a 6, but keep in mind that very old horses will be more difficult to assess on the scale of Body Condition Score. The guideline for most horses is to feed 1.5-3% of their body weight (in dry feed) each day. As we mentioned earlier, horses are designed to nibble all day, but since we all don’t have pastures to graze our horses on, most of us feed horses on our schedules. That being said, try to spread the amount of feed out into as many feedings as you possibly can to minimize health issues like colic and gastric ulcers. If you have an easy keeper, you will feed closer to 1.5% body weight, and if you have a hard keeper or a very athletic horse, you will feed closer to the 3% body weight. This is where your weight tape comes in handy. Make sure to tape your horse once a month and increase their feed when they lose weight, and decrease it when they gain weight. By keeping tabs on the weight tape throughout the year, you will start to know in advance when to increase or decrease their feed due to weather or activity changes. Keep in mind that all of these articles are regionally specific, but they have some great information to build your horses’ nutritional program on! Happy Feeding!